Yesterday, I ran into a parent from my old campus. We were both attending a forum for improving early childhood education. We talked about her two, fantastic children. One is in middle school now and the other is still in elementary. The younger one loves his teacher and is quite proud of his leadership on campus. Of course, every one is a leader at that campus, thanks to some incredibly dedicated and talented teachers and The Leader in Me! She told me that her daughter was an excellent middle school student, making all A's and excelling in band, but she missed her old school. Then she told me what I consider to be one of the best compliments I have ever received, "It is clear that your school was all about relationships, yet the expectations for excellent academics was equally amazing!" This was music to my ears! I have always believed that people come first. 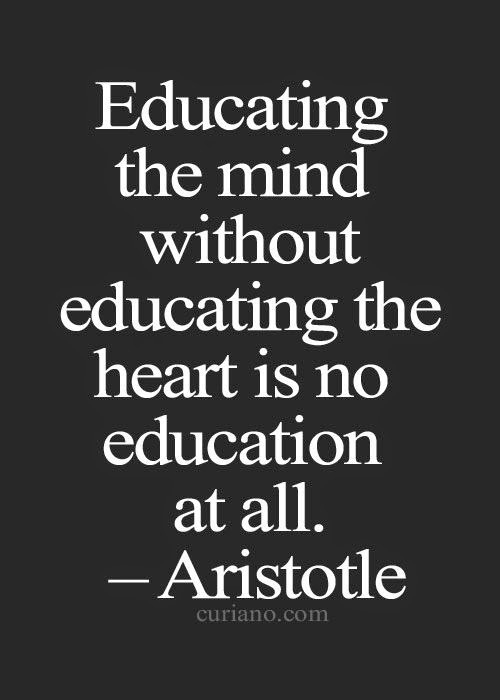 Make sure you take care of their hearts and their minds will follow. Yet I also know that learning is the reason every school exists. Academics are paramount. By no means was I perfect in my efforts. Most assuredly, I made many mistakes along the way. It is still one of my burning questions, "How do we ensure that the little people we get for seven hours each day leave as caring human beings with as much smarts as we can get in their brains?" School is not only meant for filling brains and creating a growth mindset, it is also meant to create little humans who genuinely care for the people and the world around them. I loved hearing that we did both! I still say all the credit goes to the fantastic teachers and staff that made it happen, but it was nice to be included in the best compliment an educator can hear!